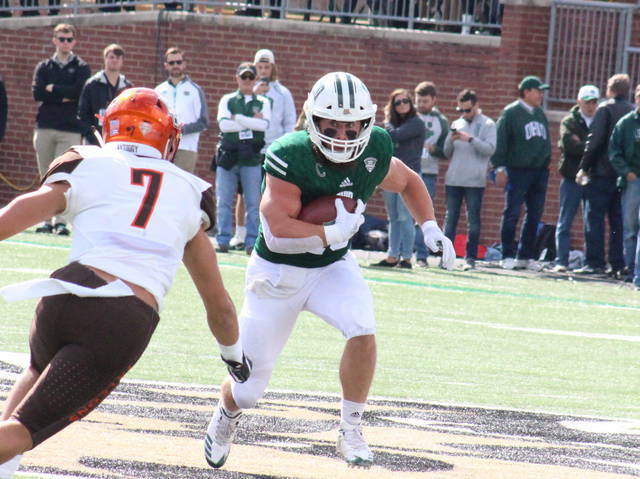 Ohio junior Nathan Rourke breaks away from two Falcon defenders, in front of teammate Austen Pleasants (60), during the Bobcats’ 49-14 victory on Saturday in Athens, Ohio. OU senior Papi White (4) makes a touchdown grab over BGSU senior Robert Jackson Jr. during the first quarter of Ohio’s 35-point victory on Saturday in Athens, Ohio. ATHENS, Ohio — Run early, run often. 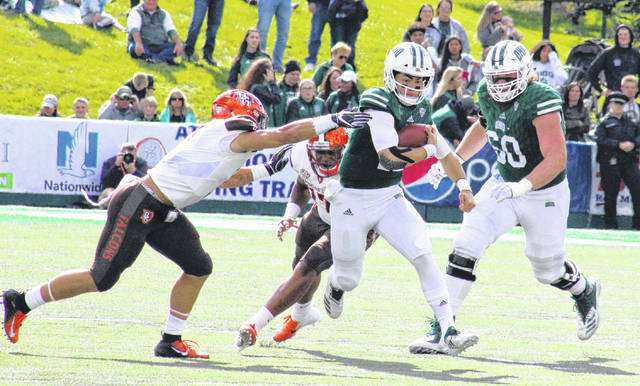 The OU football team ran for 392 yards, 343 of which came in the first half, as the Bobcats rolled to a 49-14 victory over Mid-American Conference guest Bowling Green, in Ohio’s annual homecoming game on Saturday in Peden Stadium. The Falcons (1-7, 0-4 MAC) — playing their first game under interim head coach Carl Pelini, a former Bobcat assistant under Frank Solich — scored on the game’s opening drive, as Jarret Doege found Scott Miller for a 57-yard touchdown pass. Nate Needham added his first of two extra points, giving BGSU a 7-0 lead 1:06 into play. Ohio (4-3, 2-1) answered with a 12-play, 78-yard drive that lasted 6:05, with senior wide receiver Papi White scoring on a 17-yard run. Following White’s first touchdown run since 2016, Louie Zervos made his first of seven successful point-after kicks, tying the game at seven with 7:43 left in the first. 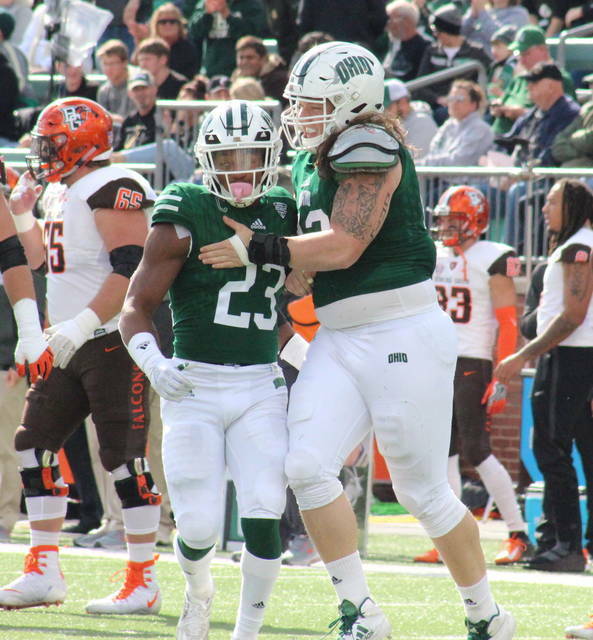 The Bobcat defense came up with a three-and-out on the ensuing BGSU drive, and the hosts regained possession at their own 31. Ohio needed seven plays and 3:13 to cover 69 yards, with White catching a 16-yard pass from Nathan Rourke to give the Green and White a 14-7 advantage. The Falcons took the game into the second quarter and tied the game at 14 on their next possession, with Doege connecting with RB Marlow III for a seven-yard touchdown on the ninth play of the drive. The Bobcats reestablished their seven-point lead on the next play from scrimmage, as White caught a 76-yard touchdown from Rourke with 13:19 left in the half. The scoring play is both the longest pass in Rourke’s career and the longest reception in White’s. The Falcons suffered the game’s first turnover on the next drive, as Evan Croutch picked off a pass at the BGSU 36. Ohio increased its lead to 28-14 three plays later, as Rourke found Andrew Meyer for a 24-yard scoring pass. The Green and White put one more touchdown on the board before the half, with Rourke capping off a nine-play, 84-yard drive with a 20-yard run. In the second half, Ohio’s defense made BGSU punt on all-3 possessions, never allowing the Falcons inside the OU 37. After a punt on their first drive of the second half, Ohio increased its lead to 42-14 with 3:14 left in the third, as Rourke tossed a 15-yard touchdown to Cameron Odom, capping off a six-play, 85-yard drive. The Bobcats scored for the final time on their next drive, with quarterback Quinton Maxwell rushing in from five yards out. Following the 49-14 victory, Solich was happy with his team in all phases of the game. “I think our guys played very well today,” said Solich. “It might have been the first four-quarter ball game we played at this level. That was really good to see. I thought all three units did some excellent things. Offense, defense, and special teams, as you go through it they all played a complete ball game. Solich also acknowledged that the Falcons didn’t enter the contest with under the best circumstances. Ohio claimed a 32-to-13 advantage in first downs for the game, while outgaining the guests by a 597-to-314 clip in total offense. Both teams lost a fumble, with the Bobcats winning the turnover battle by one thanks to Croutch’s interception. BGSU was penalized seven times for 78 yards, while OU was sent back four times for 29. Ohio punted just once, while forcing Bowling Green to punt five times. While happy with the win, Solich noted that the Bobcats still have work to do to reach their maximum potential. Rourke finished with 107 yards and one score on 10 carries, to go with an 8-of-12 passing day for 193 yards and a career-best four touchdowns. Maxwell completed his only pass for 12 yards and ran three times for 21 yards and one touchdown. 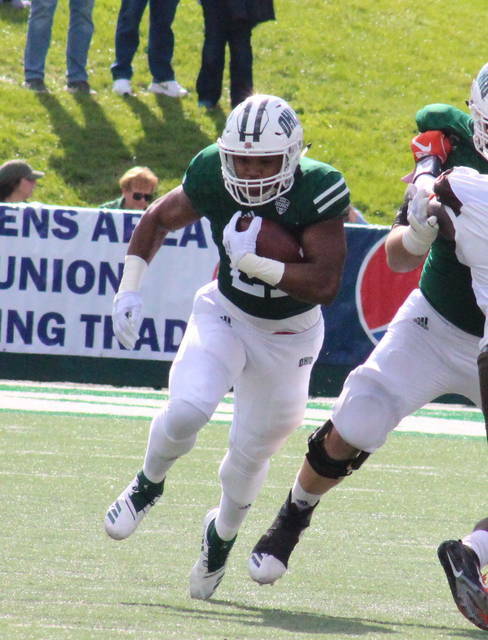 Maleek Irons led the Bobcat ground attack with 116 yards on 12 carries. White finished with 109 total yards and a career-best three touchdowns on two receptions and one carry, while A.J. Ouellette added 93 yards on 14 carries and a reception. Meyer had a team-best three receptions for 52 yards and one score, Isiah Cox added 22 yards on one grab, Odom had one 15-yard touchdown catch, while Connor Brown had one reception of 12 yards. David Burroughs and Jake Neatherton had four carries apiece for Ohio, gaining 37 and 24 yards respectively. Tyler Gullett led the Bobcat defense with nine tackles, including a sack. Amos Ogun-Semore also had a sack for Ohio, with Cole Baker forcing a fumble and Will Evans recovering. The OU defense combined for eight tackles for a loss in the win. Doege was 19-of-24 passing for 214 yards and two touchdowns, with Miller leading the Falcon receiving unit with 145 yards and one touchdown on six receptions. Rico Frye and Bryson Denley paced the Falcons on the ground with 36 yards apiece, on eight and six carries respectively. Jerry McBride III led the BGSU defense with 10 tackles, while Marcus Milton claimed the team’s one sack and Robert Jackson recovered a fumble. 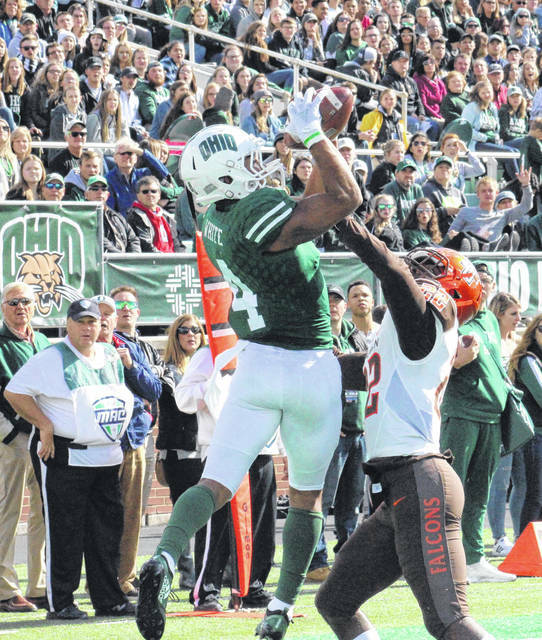 The Bobcats are still just 28-40-2 against the Falcons all-time, but improve to 6-6 against BGSU in the Solich era. Ohio will be on short rest, but remains in Athens for its next game, as Ball State visits Peden Stadium on Thursday.